Okay, on to the tasting. 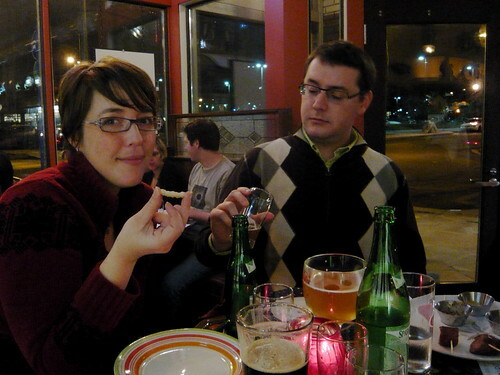 Sarah and Steve put together five pairings of beer and cheese. The tastes of cheese were cut from the center of the wheel to the rind so that we could get the full experience of the cheese. They were nice hunks — enough to get at least three or four bites. I had no idea Thom was looking so beer-studious in the background there. Steve called this his “regional” pairing. The Elk Mountain is an aged farmstead cheese* which is washed in a local (to them) beer. The cheese was dry and not very “goaty” but with a strong flavor that mellows the slightly bitey beer. HUB stands for Hopworks Urban Brewery and they are new to the Portland brewing scene. They have a restaurant and brewpub on Powell Blvd and seem to be doing a great business. We like them a lot. Sarah called this a “small” beer which means that it is a second brew made using the spent grains of the first beer — lower in alcohol content and milder than the first brew which, in this case, is HUB’s Diablo. * Farmstead cheese is cheese made from the same people who farm the animals that produce the milk. This was something I did not know before this tasting. Steve dubbed this the “comparative” pairing. This was a creamy, smooth hard cheese with very small “crystals.” It’s an artisinal cheese* and it was very delicious with the beer. This was a nicely satisfying pair. The Scotch Ale was slightly bitter and malty and the two just really worked well together. * Artisinal means that the cheese was made by hand and in small batches. Steve called this one a “contrast” pairing. He brought out the chunks of Robiola on crackers and we all oohed and aahed over this creamy looking cheese. It was very white with a runny, yellow rind. It was quite salty and tongue-coating. It was so rich and wonderful that as much as I thought I could eat a whole wheel of it, I’d probably have to stop after a few bites. This would be a really great one to have on a cheese platter at a party. The beer was a real balancer — a strong, malty big beer almost like a porter. Great seasonal. From Switzerland, this earthy gruyere comes from the caves of Hervé Mon — who is apparently a gentleman and an affineur. He collects the cheese from the makers, who get their milk from dairy producers, and he cares for them and ages them in his caves. His art is in the aging. I don’t have much experience with gruyere but after this it may be a new favorite. It had a strong, deep flavor, slightly tangy with grassy notes. It had small crystals and was just a nice, satisfying cheese. It was paired with Duchesse which is a dark fruit ale, almost like a sherry. The tartness of the beer was nearly cancelled out by the cheese leaving a far sweeter flavor in the mouth. This was the first pairing where I felt that there was a real back and forth between the cheese and the beer, almost like a wine. Sarah and Steve called this their punk rock pairing. They said that they wanted to do something loud and bold that would really create an impression. This was totally right on. It was similar to the last pairing, in that you had a strong flavor in the cheese and a very strong tart flavor in the beer and they worked together to mellow each other in the best way. The shropshire is bright orange from the addition of annato and run through with blue veins. It has a strong blue flavor. The Grand Cru was incredibly sour and full of cherries. The two balanced each other but each really had such strong flavors that they weren’t totally mellowed by the other. A really fun pairing that was a great end to the evening. Besides being a really lovely night out with our friends this was a great kickoff to what I hope will be a year packed with cheese exploration. The cheese was fantastic and the beer was exceptional. What really made the evening great, though, was the enthusiasm of both Steve and Sarah for their trade. They both gave plenty of personal time at each table answering questions and were just really engaging and high energy. I could tell that they love what they do and I hope they were having as much fun as we were. That’s how I look at every beer: with a look of surprise and disdain. Ha. That’s the most bizarre photo I think I’ve ever seen of myself. It’s funny, being from the Midwest I will always think of Wisconsin’s infamous “beer cheese” spread. High school kids used to sell it door to door every year as a fund raiser. It was mostly processed, I’m sure, but the very idea of it gets the mouth watering. Cheese and beer is a marriage made in heaven. To me, the classic ploughman’s lunch reminds me of a real farmer’s lunch. I’ve started home brewing and have come across a few videos with cheese and beer pairing. Do not research on an empty stomach! Art, that sounds wonderful — mmm…. beer and cheese. It is truly great together.